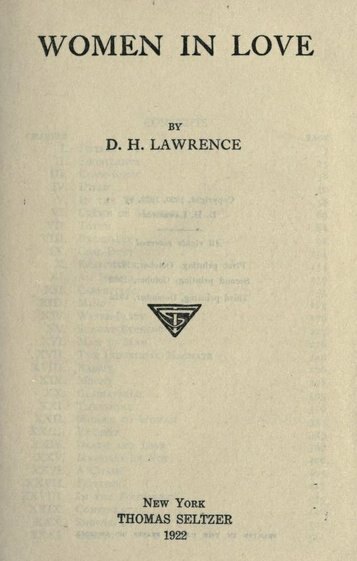 Women in Love, D.H Lawrence's sequel to The Rainbow (1915), continues to follow the lives of Ursula and Gudren Brangwen; two sisters living in the Midlands of England; a teacher and an artist respectively. They meet two local men, chool inspector Rupert Birkin and coal-mine heir Gerald Crich. Ursula and Birkin become romantically involved and Gudrun enters a love affair with Gerald. Although tame by today's standards, Women in Love caused great deal of controversy over its sexual subject matter. Return to the D. H. Lawrence library.